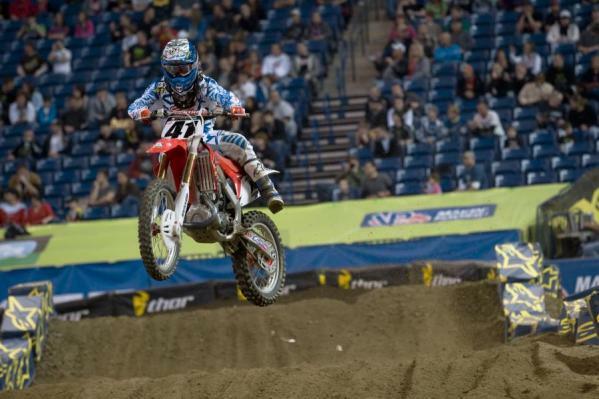 Timed sessions from the beautiful and very blue Lucas Oil Stadium in Indianapolis are over and the stars seem to be aligning themselves at the forefront. The track is very technical with a tricky on-off section after the start that many riders struggled with early on but seemed to have nailed down by the end of the second timed session. The whoops are deep and the cinnamon sand section can definitely take a bit out of you as Dean Wilson can attest to. In the first timed session for the Lites class, DNA Shred Stix/Star Yamaha’s Ryan Sipes was setting the track ablaze topping the leaderboard with a 49.185. Last week’s winner Blake Baggett looked smooth in the first timed session as well setting the pace behind Sipes with a 50.213. Dean Wilson (50.350), Justin Barcia (50.771), and Matt Lemoine (50.843) rounded out the top five. Sipes was on fire in practice, setting the fastest laps in both timed sessions. In the AMA Supercross class James Stewart set the pace early with a 48.956 and was the only rider to post a lap time under the 49 second mark in the first timed session. Defending champion Ryan Dungey looks poised to make a run at his first win of the season aboard his Rockstar/Makita Suzuki and followed Stewart on the leaderboard with a 49.206. Series points leader Ryan Villopoto (49.490), Trey Canard (49.533), and Justin Brayton rounded out the top five. In the second timed session it was Sipes once again on top the leaderboard with a 48.836 besting his own time of 49.185 in the first timed session. Dean Wilson would follow with a 48.932, but did take a spill in the cinnamon sand section, although he did remount and seems to be 100 percent for the night show. Justin Barcia was the first and only rider to double out of the sand section and followed Sipes and Wilson with a 49.540. Matt Lemoine looked impressive last week and seems to be picking up right where he left off. He was fifth fastest in the first timed session and bested that time with a 50.123 in the second session, finishing fourth. GEICO Powersports Honda’s Blake Wharton rounded out the top-five with a 50.161. 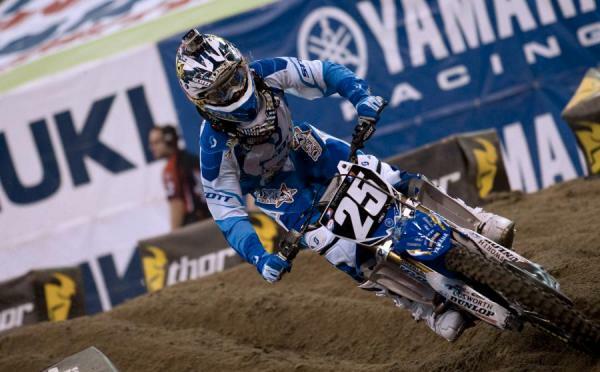 Canard nipped Villopoto at the end, setting the fastest lap of the night. James Stewart must have been watching Barcia, because he quickly picked up on the double out of the sand. But there was one big difference--he was doing it on the inside. Soon everyone was picking up on Stewart’s line and it seems that will be the line to take tonight. Villopoto led the entire second practice with a 48.357 until he was trumped by Canard on the last lap with a blazing fast 48.301. Stewart would take third with TwoTwo Motorsport’s Chad Reed bouncing back from a disappointing first timed session to finish fourth with a 48.692. Ryan Dungey would round out the top-five with a 48.734. It looks as if all the top guns are on top of their game tonight and the track is looking primed to give them a chance to bang some bars in front of a packed house. Remember to get all of your up-to-the-minute news from the Indianapolis Supercross from Racer X Online and our Twitter feed @racerxonline.com.